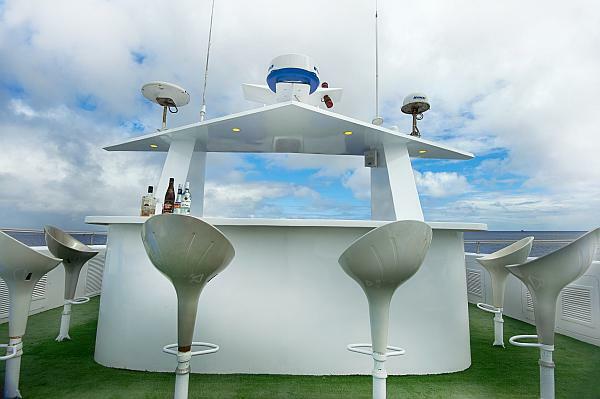 The steel vessel Galapagos Master offers certainly some of the highest safety and comfort features of all Galapagos island liveaboards. The ship was built in 2004 and operated initially as "MV Deep Blue". 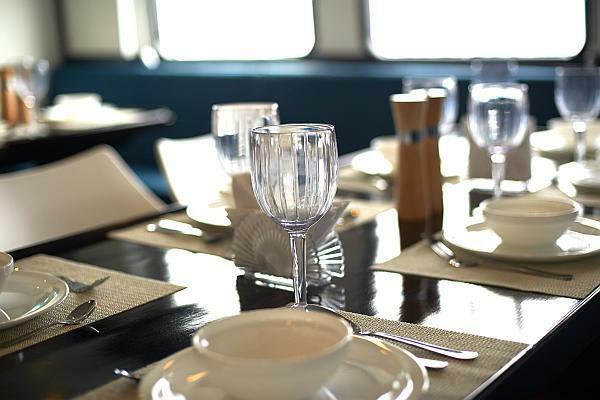 It was the widely known company "Worldwide Dive and Sail LTD" wich adopted and incorporated this vessel into the "Master liveaboard" fleet in 2015, the process included a complete renovation and modernization. 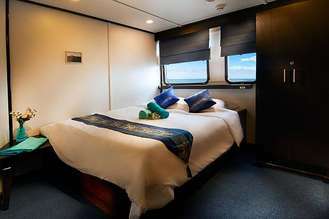 Galapagos Master Liveaboard offers space for 16 customers in 9 comfortable cabins with private bath located in the lower, middle and upper deck. 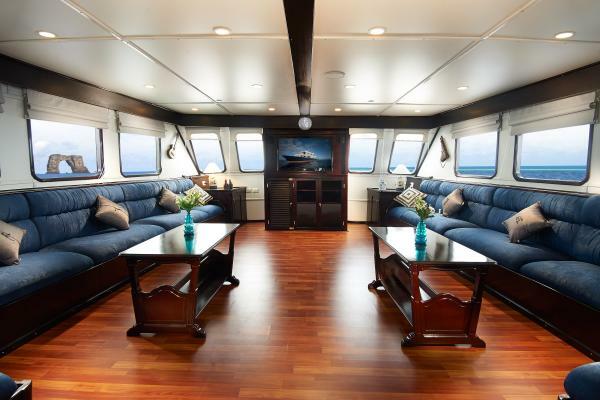 In the middle / main deck there is a spacious lounge with cushions seats, flat screen TV and Hifi sound system. 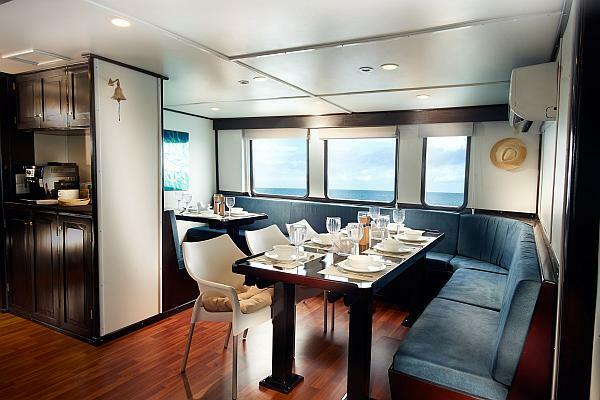 Also at this level is located the dining area with cocktail bar and a library with entertainment center and a spacious indoor photo area with charging stations (US flat pin plug 110 Volt) at the rear. 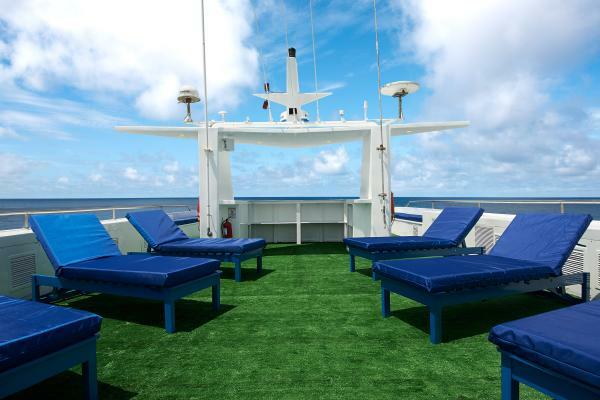 The upper deck offers a shaded outdoor area with cushioned lounge chairs and benches and for sun worshipers there is an additional top-level sun deck and front section also with cusioned lounge chairs. 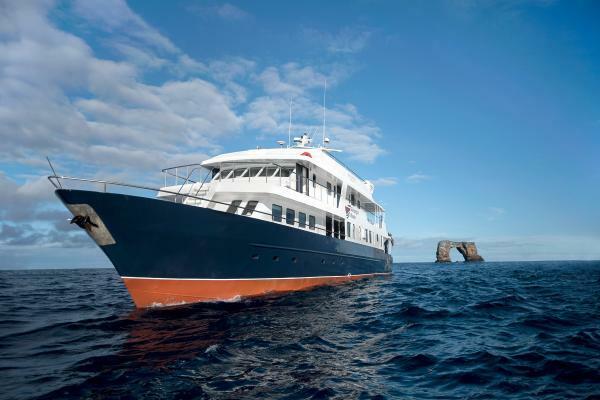 The Galapagos Master usually offers 7 nights trips with 6 diving days, including 3 days of diving in Wolf and Darwin. Divers will benefit from 18 to 20 dives. You want to enjoy even more dives? There is a limited selection of 10 and 14 nights dive cruises scheduled. 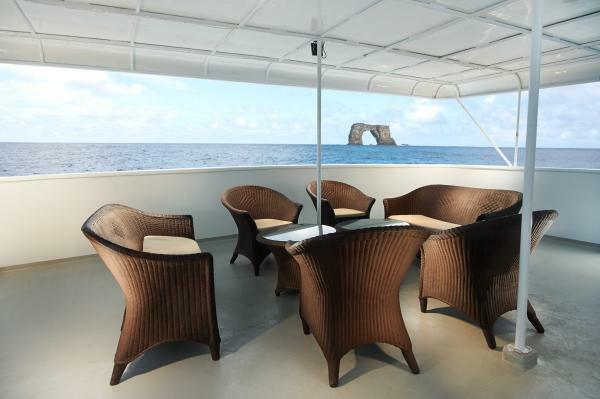 The Galapagos Master accommodate 16 divers in 9 cabins. 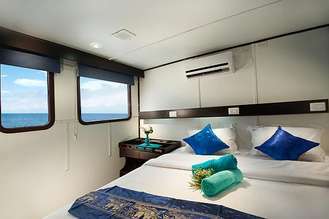 All cabins are equipped with privat bathroom with bath and shower, hot water, hair dryer, bath rope, personal safe and adjustable air conditioning. 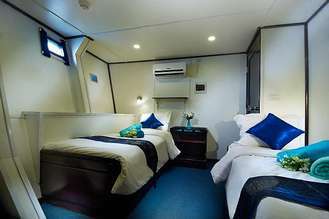 4 Twin bed cabins (2 single beds) with port hole are located in the lower deck, 1 double bed cabin with windows on the main deck and 4 twin bed cabins with panoramic windows on the upper deck. 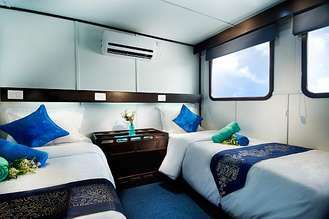 6 of the twin bed cabins can be converted into double bed cabins. 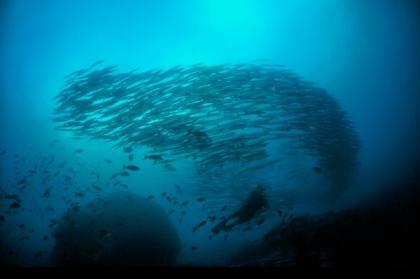 The Galapagos Islands are a challenging dive area, at least 50 dives and drift dive experience are required to participate. The standard 7 nights trip include 18 to 20 dives, 10 nights trips up to 30 dives. Divers may enjoy up to 4 dives daily. 3 days are spent at Wolf and Darwin the top spots for sharks and pelagic fishes. The 4th dive can be replaced by a night dive, provided the boat is anchored in a sheltered bay and at discretion of the crew. 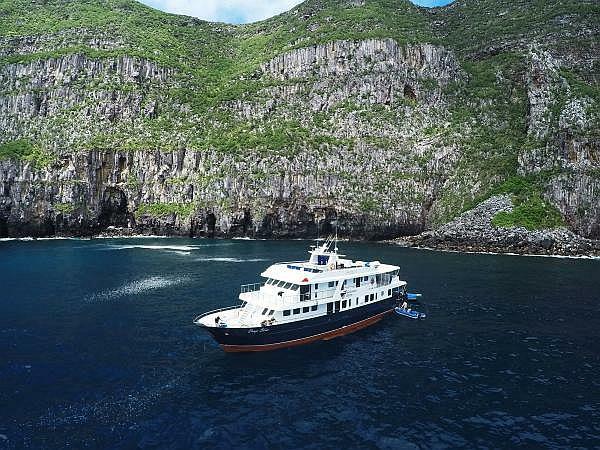 To make sure the guests get to see enough of the islands it is possible on the days 2, 7 and 10 to replace the dives 3 and 4 with the visits to North Seymour, Santa Cruz and Isabela island. The dives take place from tenders (zodiacs). The dive- and naturalist guides are certified by the National park authorities. Located on the rear - main deck photo- and videographers find convenient indoor camera set up station with 110 volt US flat pin connectors and drawers for storing items and parts. 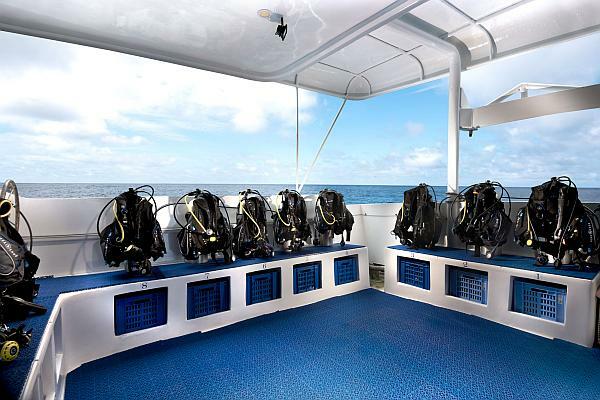 The spacious diving platform is equipped with tank holders, equipment boxes, rinse tank, 2 showers and two camera and video tables. Tanks: 80 cu feet 12 liter Aluminium tanks with INT and DIN Valves, 12 and 15 liter Steel tanks are available for an additional fee. Rental gear: complete Aqualung Calypso regulators, Aqualung 7mm wetsuits, masks, open (booties) and closed fins, dive lights, dive computers, SMB's, Nautilus lifeline. Nitrox and Tek diving: Nitrox membran system. EAN 32 is available for an aditional fee. No Tek dive facilities. - Transfers between the hotel/airport and the boat on San Cristobal island on the first trip day and between the boat and San Cristobal airport on the last trip day. 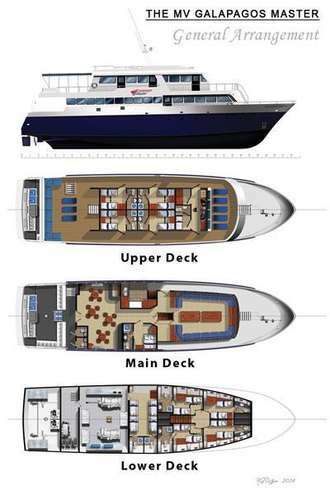 Master Liveaboard has seat allowance for all guests boarding Galapagos Master and using the Avianca flights to/from San Cristobal. Therefore we recommend to book the flights from Quito or Guayacil to San Cristobal right away together with the dive expedition reservation with us. Return flights between Quito/Guayacil and San Cristobal with the airline Avianca cost between USD 480 and USD 590 depending on itinerary and season. Included are USD 40 for special services such as a WWDAS representative who will assist you with check-in and paperwork in Quito / Guayacil, the Ingala transit card which you will have to pay anyway and otherwise costs USD 20, priority check in, 30 instead of 23 kg for Your travel baggage.